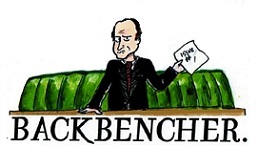 The Backbencher – How Best To Combat Gun Violence? 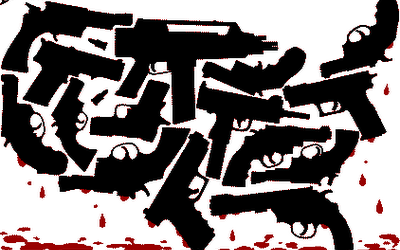 How Best To Combat Gun Violence? Here are some stats that made me incredulous as to why gun regulation had stalled at US Federal level and why more hasn’t been done at State level. All the US military and coalition deaths in Iraq and Afghanistan, multiplied by 5, doesn’t equal the deaths by gun violence in America since Newtown (Sandy Hook). 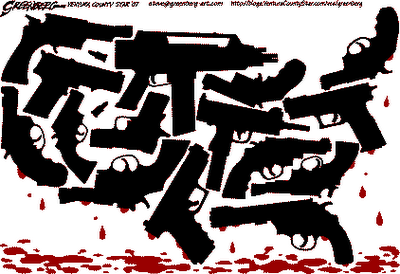 Since the Sandy Hook mass shooting on December 14th, 2012, guns in the US have killed 44,364 people. Americans overwhelmingly support expanding background checks: in March 2013 a CBS News poll found that 90 percent of Americans favour background checks on potential gun buyers. Of course we must consider and ask ourselves why the gunman is normally an alienated young man with deep troubles, and who has not received any help. But that is not a short-term solution, and neither is banning all guns, which would be rash, unconstitutional and an affront to American liberty. The problem with most gun control laws is that they impose on the law-abiding citizen a burden that lawbreakers can usually evade. One solution, and one of the most effective solutions, as it has been proved in cities like Chicago and New York, is to increase the Police presence on the streets. The only problem with it is that, with public debt spiralling in the US, it may simply be unaffordable right now. That is for American politicians to decide. However, gun deaths can also be reduced by simple decisions. Legislators need to start somewhere to reduce the huge death count. There needs to be a ban on assault weapons: if this cannot happen at Federal level, then it needs to be enacted in State legislatures, as some have already done. Although a gun enthusiast myself (I own a shotgun) and a lover of individual liberty, I struggle to see why a normal citizen has any need for a weapon with the killing ability similar to those issued to soldiers, nor do I like the idea of citizens or criminals, whether normal or mentally unstable, being able to walk around carrying their weapons, concealed or otherwise, as is legal in some States. In Britain, if you wish to own a shotgun, a firearms officer comes to your house and asks you: why you want the weapon? Where are you going to keep it? Who else has access to it? Etc. etc. And for a shotgun licence, the applicant, yes the applicant, needs a referee, someone to comment on their character and the state of their mental health etc. And the referee isn’t just witnessing a signature, he is putting his reputation on the line: if the applicant then goes off and shoots someone, the referee is liable for prosecution. He must think long and hard. All this has helped the UK have only 62 shooting-homicides a year over the last 15 years. Canada has similar rules; it now requires a 28-day waiting period to buy a handgun, and imposes a clever safeguard: gun buyers should have the support of two people vouching for them, making sure guns do not fall so easily to criminals. So, as a British shotgun owner, I am required to keep my gun locked up and the key hidden when I am not using the weapon. Now to me that seems extremely reasonable, and surely that should be the law in America. If so, then possibly Adam Lanza would never have been able to gain access to his mother’s guns and shoot dead 20 unarmed children aged 6-7. However Americans have a fixation with owning their own firearms. It comes from a deep historical mistrust of the Federal government in many States, and because many Americans believe they must be armed in order to overthrow a Tyranny if one should ever occur. I think Americans should be allowed to own their own guns, but that there needs to be more safeguards and checks, or otherwise thousands of innocent people risk losing their lives. If you still disagree with any attempts at all to limit gun violence, even merely with things like expanded background checks, limited actions that make perfect sense and that are thought to be needed, maybe this will soften your resolve.